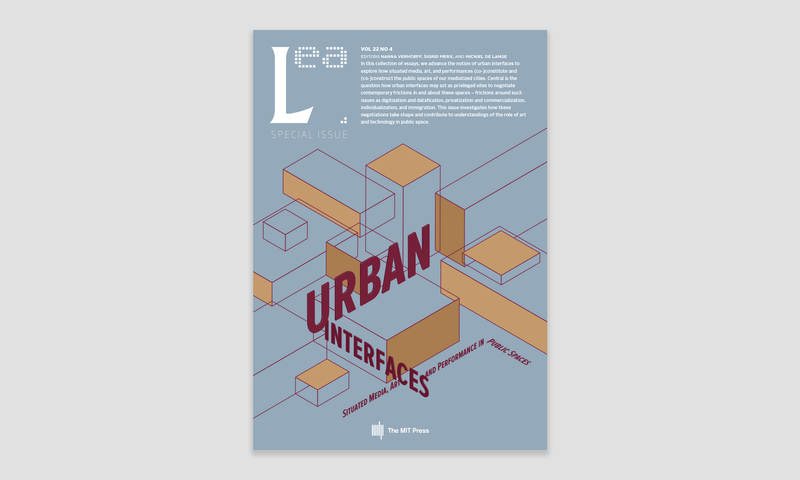 Description: In this collection of essays, we advance the notion of urban interfaces to explore how situated media, art, and performances (co-)constitute and (co-)construct the public spaces of our mediatized cities. Central is the question how urban interfaces may act as privileged sites to negotiate contemporary frictions in and about these spaces – frictions around such issues as digitization and datafication, privatization and commercialization, individualization, and immigration. This issue investigates how these negotiations take shape and contribute to understandings of the role of art and technology in public space. Reference this volume: Verhoeff, Nanna, Sigrid Merx, and Michiel de Lange, eds. Urban Interfaces: Media, Art and Performance in Public Spaces. Cambridge, MA: LEA / MIT Press, 2019. Acknowledgments: The Leonardo Electronic Almanac is a collaborative effort supported by MIT Press, Leonardo/ISAST, Goldsmiths, New York University (Steinhardt School of Culture, Education and Human Development), OCR (Operational and Curatorial Research), and CAC (Contemporary Arts and Cultures).